The cookout at Valdosta State made the news, with SpectraBusters.org No Pipeline signs. Taylor also says the organization hopes the University will pledge not to invest any more money in fossil fuels. 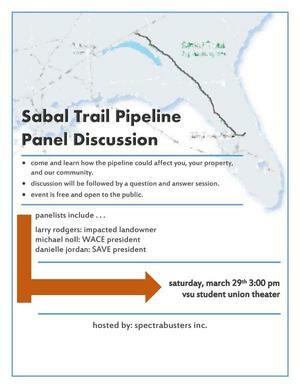 Resolutions against the Sabal Trail pipeline have already been passed by Lowndes County, Valdosta, and five other counties and one other city (Albany) in Georgia and Florida. VSU divesting its fossil fuels would send another signal. Cookout at VSU for Global Divestment –S.A.V.E. Fracking for fossil fuels causes new pipelines and LNG export, and without investment none of that will happen. 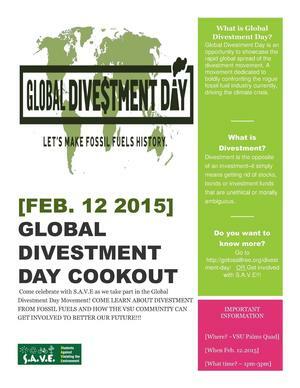 Come celebrate with S.A.V.E as we take part in the Global Divestment Day Movement! Come learn about divestment from fossil fuels and how the VSU community can get involved to better our future!! !